By piling up the strikeouts in his last month of starts, Dallas Keuchel is making a bid to be one of fantasy baseball's top-five pitchers. But what's behind the newfound whiffs? The balance of power in baseball has shifted to the middle of the country. The three best records in the league belong to teams that play their home games in the Central time zone, and none of the three is more surprising than the Houston Astros. One of the key members of the team’s sudden relevance is Dallas Keuchel, who has become a bona fide ace. While that, in and of itself, is surprising, the way he has continued to grow as a pitcher is even more unexpected. After making 38 starts in 2012 and '13, Keuchel got his first real taste of success in the bigs last year, primarily by taking his strong ground-ball skills and making them elite. Last season, Keuchel posted a 63.5% ground-ball rate and surrendered just 11 homers in 200 innings. This year, thanks to a sinker, slider and change that are all plus pitches, his ground-ball rate is up to 64.8%. Keuchel has deft command of all the offerings in his repertoire. If you need further proof, check out his zone profile for this season. We might as well start referring to belt-high pitches from Keuchel as Halley's Comet, because they just don’t come around that often. 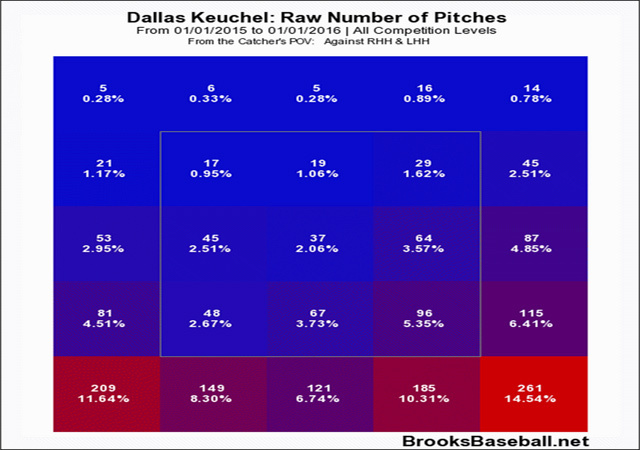 A whopping 74.2% of Keuchel’s pitches this year have been either at the knees or below the zone. Of the 463 pitches he has thrown at the belt or higher, 328, or 70.8%, have been four-seam or two-seam fastballs. Basically, the only time Keuchel elevates is when he’s trying to blow some heat past a hitter. That’s not just elite command—that’s downright Maddux-ian. It’s also one of the surest routes to going 11–3 with a 2.14 ERA and 0.99 WHIP through the first three months of the season. Having said all that, I was still touting Keuchel as a sell-high player for much of the first half of the season. Furthermore, I stand by the reasoning behind my recommendation. While Keuchel had all the tools to remain a good real-life pitcher, the simple fact that he didn’t offer much in the way of strikeouts had me dubious on his future fantasy value. Even as he proved himself a capable major league starter in 2014, his strikeout rate was just 18.1%. Through May of this season, it was improved, but still below league average at 19.3%. All those extra balls in play, I figured, would lead to more ground balls rolling through holes and more bloopers finding outfield grass. Without the strikeouts, I said, he wouldn’t continue being an elite fantasy pitcher. For the first three starts after I first suggested Keuchel as a sell-high candidate, he made me look like a genius, allowing eight runs on 20 hits in 21 innings in those outings and striking out just 12 batters. In the fourth start, however, he whiffed 11 White Sox in a complete-game shutout. Keuchel made six starts in June and struck out at least seven batters four times, including a season-high 12 against the Yankees on June 25. The trends suggest that the strikeout-ace version of Keuchel is here to stay. If that’s the case, he’ll be a top-five pitcher the rest of the season. ​Keuchel has progressively missed more bats all season. He posted a 16.3% strikeout rate and 5.35 K/9 in April. Those numbers jumped to 21.6% and 7.66 in May, then climbed even higher to 24.9% and 8.86 in June. To wrap your head around how impressive it is for a pitcher to fan one-quarter of the batters he faces, understand that only 17 pitchers are at or above that level this season, and 10 of them are in the National League, meaning they get the benefit of facing a pitcher once for every nine batters. Keuchel’s June strikeout rate would have him ahead of Felix Hernandez, Matt Harvey and Johnny Cueto if he sustained it for the entire first half. 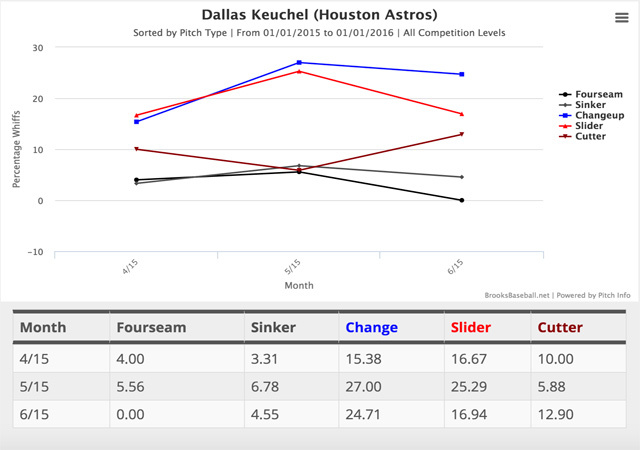 There’s nothing readily identifiable in Keuchel’s pitch mix to explain his increasing strikeout rate. He has thrown the sinker at least 52.6% of the time every month. His slider and changeup, meanwhile, have alternated between being his second- and third-most used pitch from month to month, but neither deviated too significantly from its season-long usage rate in any one month. 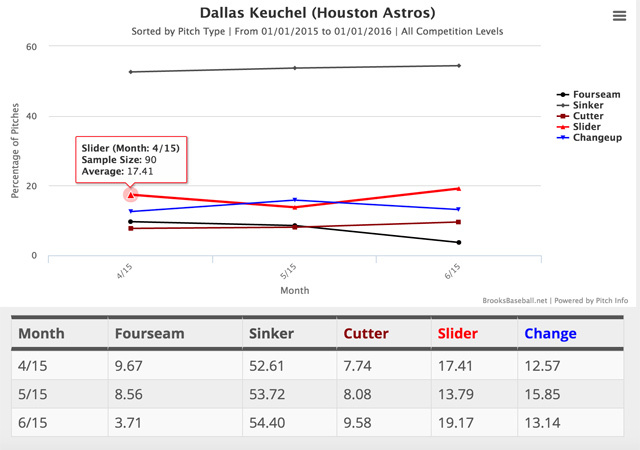 ​The one major difference in Keuchel’s usage is that he has eschewed the four-seamer, throwing it just 3.7% of the time in June. In its place, he’s throwing more sinkers and cutters. Now everything he throws with noteworthy frequency has discernible movement, with all of his pitches but the changeup moving away from lefties. Moving on to his whiff rate by month, we do see some noticeable shifts, but, again, nothing that really shines a light on why his strikeout rate has improved. ​The changeup has become a real swing-and-miss weapon for Keuchel, while the slider had one month of an elite whiff rate, but dipped back down to merely well-above average in June. Keuchel achieved a 12.9% whiff rate with his cutter in June while throwing it a season-high 9.6% of the time. Not only has the cutter been better in terms of getting empty swings than the straight four-seamer, but opponents also haven’t had near the level of success they did against the latter pitch. Keuchel has limited hitters to a .273 batting average with zero extra-base hits on the cutter, but they’re hitting .348 with a .565 slugging percentage against the four-seamer. Let’s take a look at each of his four pitches in action, starting with the slider, which might actually make you laugh because of how filthy it is. The cutter has a similar shape, so we’ll go to it next. Keuchel is able to pair the pitch with the slider the same way a lot of pitchers use a four-seam fastball and changeup in conjunction. Up next is the sinker, which he can also command beautifully down in the zone, as he does here against Alex Rodriguez. Given the pitch’s location, Rodriguez isn’t doing anything more than fouling it off down the third-base line if he makes contact with it. Finally, here’s the changeup. When Keuchel has this pitch working, he’s an absolute nightmare for righthanded hitters. Keuchel was already among the best in the league at getting ground balls and inducing weak contact, evidenced by a combined hard-hit rate from last season and this season that sits right at 20%. If he can continue to be an above-average strikeout pitcher, there really is no ceiling on how high he can rise in the fantasy ranks.